Total Head: Up to 36.0 mtrs. Flow Rate: Up to 77.1 lps. Flow Rate: Up to 19.4 lps. Flow Rate: Up to 74.0 lps. Self & Quick priming mechanism, capacity up to 8 mtrs. The design speciality of these pumps allow pumping out certain amount of mud,dirt and suspended solids. Suitable for handling water and non corrosive liquids having temperature 60 degree Celsius. Non clog and semi open/open type impeller enables to handle solids 7 to 38 mm as per model. Back pull out design enables to service without disturbing the pipe line. Stuffing box arrangement with greased Graphite asbestos gland packing for low maintenance. Easy maintenance with interchangeable parts and separae gland cover. Option available- Monoblock pumpset design or Bare pumps. Option for coupling with Motor or Engine for Bare pump. SKF or Imported bearing are used for smooth running and long life. Anti corrosive EN-8D grade steel shaft and aluminium pressure die casted rotor for monoblock. Pump Casing, Bearing housing,Impeller and motor body are made of C.I. Gr.FG200 by shell core moulding process for required with smooth finish of internal vanes for better hydraulic performance. Stamping are used of CRNO Silicon Steel material with M-47 Grade for better efficiency. Suitable in wide voltage variation up to 180-240 Volts for 1 PH and 380-440 Volts for 3 PH. 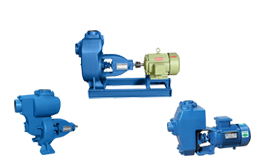 Wide range of pumps for appropriate as per requirement. Suitable for pumping muddy water , sewage,polluted liquids including solids etc. For de-watering at Basements,Trenches,Swimming pools and Construction sites etc. For handling chemicals,petrochemicals such petro,diesel,kerosene etc. For Handling ash-water in thermal power with special MOC offered. For handling liquid cargos from ship or plane. Usefull in tiles and marble factories for handling waste liquids. For Salvage operations such as saving ship or cargo, fire fighting etc. Any application where priming and foot valve is to be avoided.